The Shenandoah Valley Art Center, during the month of September, is exhibiting in the Cabell/Arehart Gallery the artwork of BozArt, an artist’s cooperative located in Charlottesville. As a diverse group of artists exhibiting together, their mission is to effectively represent accomplished artists who are committed to creating original works of art. The gallery supports the artistic vision of its members without exclusive focus on the commercial salability of their work. Opportunities to be a part of an art community, to share resources with other artists, and to further develop a professional artistic reputation are additional benefits to gallery members. They strive to preserve and protect freedom of expression and views this freedom to create as a form of free speech. They respect an artist’s right to communicate his/her ideas artistically, and have agreed to refrain from any act that could cause that right to be abridged. An opening will be held Saturday, September 3, 6:00 – 8:00 p.m. and the public is encouraged to come and meet the artists. In the members’ gallery and the docent room, SVAC member artists will present “Artist’s Choice,” works selected by the artists from their preferred medium. Back by popular demand after summer vacation! Shenandoah Valley Art Center offers, the ever popular Saturday Art for Kids, presenting a creative art experience for young artists from 10:00 a.m. – 12:00 p.m. Designed as a program that expands upon art offered in school or as an art experience for the home schooled, the classes are taught by artists who are amazing with kids. All supplies and snacks included for children ages 6 – 10 ($50 per 4 classes or $15 per class). The SVAC 2nd Annual Studio Tour will be held September 17, 10:00 a.m. – 5:00 p.m. and September 18, 12:00 – 5:00 p.m. Tour the studios of professional arts and artisans in Augusta and Nelson Counties. Partnerships between artists will place a varied collection of works at each studio location, maximizing the number of artists to be visited and diminishing the travel time for the art collector. Visit the artists’ studios and be their guest to refreshments, demonstrations, studio tours, and plenty of original artwork for sale. Open studio opportunities in the Virginia Ross Education Studio are available to printmakers and ceramic artists. Access to top of the line clay and printmaking equipment and space to work will be furnished for $60 per quarter. Apply on line at www.SVACart.com. The art center is a retail alliance partner with the Artisan Center of Virginia. In the SVAC Gift Shop you can find the perfect creative gift in fiber, jewelry, wood, glass, pottery, and more by juried artisans from Virginia and SVAC member artists. 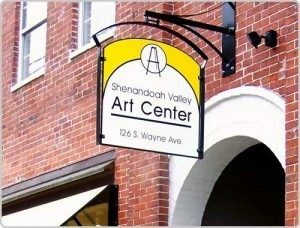 The Shenandoah Valley Art Center is located in downtown Waynesboro at 122 S. Wayne Avenue. Galleries are open to the public 10:00a.m. – 4:00p.m., Tuesday through Saturday. For more information, call (540) 949-7662 or visit www.svacart.com.